A pedal exerciser is a great option for the elderly to maintain an active lifestyle. As we age, we become more prone to falling or causing injury to ourselves, and it is with this fear that most elderly people stop exercising. 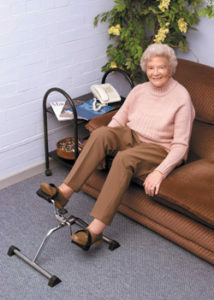 A pedal exerciser allows the elderly to exercise in a manner which is safe and effective. It is a small, portable equipment and exercises on the pedal exerciser are easy to learn, low-impact and can be performed almost anywhere. It can be used for an upper body or lower body workout and allows the user to increase circulation, coordination, muscle strength and range of motion. It allows them to maintain an active lifestyle without giving up exercising. Improves productivity and can help with multitasking. The lightweight and portability feature ensures that a workout is not missed. Watch the video below to see how a Pedal exerciser is used.